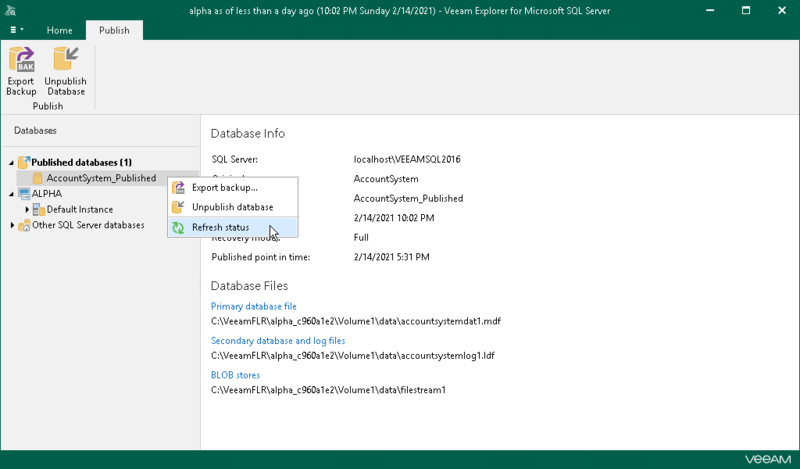 While your databases are attached to a SQL server, Veeam Explorer synchronizes each published database state to verify databases availability. By default, synchronization occurs every five seconds. If something went wrong with published databases, the question mark will appear next to each of such databases, indicating the database unavailability or incorrect state. In the Database Info section, you will also see a notification message describing the problem. To refresh a published database state manually, in the navigation pane, under the Published databases node, right-click a published database and select Refresh.